Editor's Note: Matt Litton, a writer and educator, is author of The Mockingbird Parables: Transforming Lives through the Power of Story. The social relevance of Harper Lee’s classic To Kill a Mockingbird and the subsequent film is profound. It has remained a beacon of hope for the marginalized, pointing the way toward our continued pursuit for equality. The novel has been described simply as the story of one man’s stand for racial justice, but we cannot ignore the other valuable messages–including Christian ones-for today’s culture of distrust. From Wall Street to Washington to Main Street, it seems our decisions are governed by what is financially, politically, and socially expedient. Oour faith is more of an afterthought than a guiding force. 1. Try understanding others. The theme is revealed in lawyer Atticus Finch’s memorable explanation to his daughter: "You never really understand a person until you consider things from his point of view–until you climb into his skin and walk around in it." The Christian faith originated with a God who moved into our neighborhood, who “climbed into human skin and walked around in it,” and who truly understands and connects with humanity. Redemption actually began in a movement of God’s compassion. The practice of our faith should start with that same compassion, demanding that we cease to see people who act, believe, or behave differently than us as “others” and learn to view them as our neighbors. 2. Live in the here and now. Lee’s novel challenges us to remember that our faith should impact our actions today. The compassion our faith requires should influence how we care for each other in the here and now. Who can forget the scene in the novel when the good Reverend Sykes locks his church doors until the money Helen Robinson needs to feed her family is collected by his congregation? How many of our nation’s challenges might be solved if we endeavored to care for our neighbors in that way? 3. Embrace and encourage idealism. In the book, the children emerge from watching a heated court case where an African American man is being falsely convicted of a crime. A child named Dill is disturbed by the way the prosecutor demeans the defendant simply because of his skin color. Dill, like most children, possesses an idea of how the world should operate and is unable to process the racism, oppression, and sin as normal. He comments to the narrator, Scout, that he will join the circus when he grows up. He would rather laugh at the adults than accept their bigotry. When Jesus tells his disciples in Matthew that they must “become like little children,” I wonder if he is referencing the innate sense of fairness that children own. Maybe Jesus is telling them to recapture the idealism they have lost with adulthood. Don’t many of us grow older and just accept the injustice, the poverty, the hurting people, the oppression and sin around us as “the way it is”?” So did many of the adults in Maycomb, the fictional town where the book is set. The novel reminds us that cynicism leads to complicity, that disillusionment leads to inaction. Maybe by becoming more like children, we can refuse to accept the status quo and take a closer look at our neighborhood, see the injustice, poverty, and sin for what it is and determine what it requires of us as people of faith. 4. Be guided by faith, not circumstances. Christians could also stand to remember the racism of the “good church going folks” of Maycomb, that the protagonist of the novel calls it a “disease,” and be wary that the same types of religious folks were actually responsible for the crucifixion of our Jesus. Perhaps we should pause for a moment today to determine if we are allowing our decisions to be guided by status, wealth, or political gain. Maybe we should conduct our daily business guided solely by our beliefs, like the unassuming hero that places his family and his reputation on the line to take a very unpopular court case. 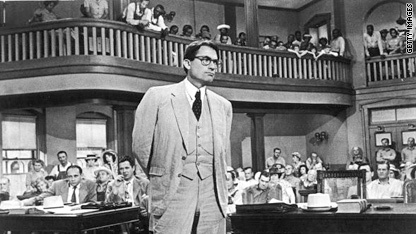 When his daughter asks why he is defending the innocent Tom Robinson, Atticus answers, “Scout, I couldn’t go to church and worship God if I didn’t defend that man.” To Kill a Mockingbird reminds us there is a spiritual approach to making decisions that can lead us to restoration on each street and in every house. The opinions expressed in this commentary are solely those of Matt Litton. Thank you very much for your insight on this novel. A lot of the comments I read are filled with hurt and pain caused by people who simply misinterpreted the bible and forced their views upon the authors of the comments. To all of those people who have been hurt by a christian, I want to take the time to say I'm sorry. I'm sorry that they have said all the negative things they said. I'm sorry that they falsely condemned you. I'm sorry that they killed thousands of people in the name of God, when all they were doing was self gratifying. But most importantly, I'm sorry that you never got the opportunity to experience Christ for yourself because of stupid people who gave you the wrong idea. Believe me when I say I AM truly, honestly and wholeheartedly sorry. Moral codes from Christianity and the Christian God? Have ever heard of Law Code of Hammurabi. This is one of my favorites as well, only I don't think it is a shinning example of Christian Faith, Finch, was showing a secular idea of society not a Christian one. Christianity like all other religions doesn't have an issue with keeping people separated by race or ideology. The compassion displayed in the story was not from the Christian towns people, the Christian Judge, Prosecutor, or any other Christian. Seems to me that Finch is the exception to the Christians rule, not the rule. It should be required reading in school. This essay is one of the simplest expressions of what so many christians claim to be but are not. I am not a christian. To Kill A Mockingbird is one of my favorite books and movies. It is a relief to see someone glean these pithy essential principles from the story and present them in this context. I see mostly expressions of hate from "christians" in politics and in the media, so this is quite refreshing. The innocence they lost, the wisdom they gained & the deep love & respect they had & life lessons they learned from their father. Atticus Finch was an educated man who possessed a great deal of courage. He spent many years away from small town hate & prejudice getting an education.Are we sure he was a "Christian" man ? Not really. He was a highly respected man that could be counted on to do what was fair. The judge in the novel had an education but had no courage ! Atticus was a wonderful role model to his children & to the whole town,( many who didn't have the courage to do the' right' thing). I respect this authors right to reflect his Christian view point in regards to the novel. What I love the most a/b America is we CAN express what WE believe. What I've written are my thoughts on this VERY memorable book. Thank you for focusing it! Its one of the finest novels I've ever read. I`m an atheist and to kill a mockingbird is one of my favorite books. I very much appreciate this article as well. I dont believe Jesus to be the son of God, but I do believe in the message of Jesus Christ. And that he stands as an exaple to us all. I think the book is critical of organized religion, opting for people to think for themselfs insted of the follow the crowd mentality that many religious groups are prone to. Someone posted that Atticus was the only flawed character because he was "perfect". I also find that to be true, but that is the point. He is christlike in this book. Something to strive for, which most people (including myself) find inspiring. I like the article, it is so true. As Christians we need to be fair, and to try our best to do the right thing! A nice but unrealistic and idealist story.. You can always right on what the world should be like, without considering what the world is. You can start over, you need to build from the ashes. Christians think they own anything that represents the tenants of their mythology. Anytime one man sacrifices himself for others, they invoke the story of Jesus. Not surprising that they're trying to hijack classic American literature... What, one fictional book isn't enough for you guys? The great irony of "To Kill a Mockingbird" is that this fine novel contains only one really flawed character: Atticus Finch. The reason he's flawed is that he's flawless. Still, the belief in fairy tale characters will easily trump reality. Harper Lee was smart enough to know this and ran with it. We're grateful she did. I thought the book was about pursuit of truth, not just equality – the great foundation of the Christian Western Civilization, like no other. Whoever wrote that tripe has no understanding of Christianity. My friend, Islam is a follow-up of the teachings in Judaism and Christianity. Which is more likely: That the whole natural order is suspended or that a Jewish minx should tell a lie?